In the first half of the century, Southern Africa was viewed as a worthless jumble of British colonies.Boer republics and African chiefdoms, a troublesome region of little interest to the outside world.But the discovery of diamonds in Kimberley and gold on the Witwatersrand in the second half of the century transformed the region’s economic fortunes and the nature of its relationships. On the back of these discoveries a struggle for control erupted fought by the Boers to preserve the independence of their republics and by the British to Enforce their supremacy. 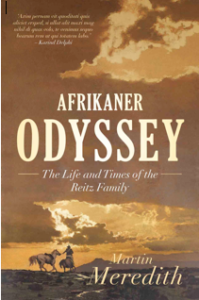 Afrikaner Odyssey is a wide-ranging portrait of an aristocratic Afrikaner family whose lives form a fine thread through these turbulent times.